It’s clear that the outdoor gear company SmithFly is living in the year 3,000. SmithFly just released an innovation that could possibly change the way we camp for years to come. The Shoal Tent is the long-awaited combination of a raft and tent. That’s right! You’re now free to camp on all the lakes, ponds, rivers, and streams that you once longed to set sail upon on that air mattress – we’ve all thought about it. Just be sure to anchor up so you don’t wake up downriver, or downwind. This 8-foot by 8-foot raft gives new meaning to the word “waterbed”. The Shoal Tent has a heavy-duty, three chamber design – two chambers in the floor, and the other chamber being the structure. This eliminates the need for tent poles, making it super-packable but still very stable in strong winds. You can use the Shoal Tent with or without the canopy or walls, giving you the option to sleep under the stars, use only the canopy, or totally enclose the tent when harsh weather hits. Ethan Smith, of SmithFly Designs, is confident that the floating tent is unlike anything in the outdoor market today, and he also believes that the Shoal Tent could change the way that campgrounds do business. Aside from recreation, Smithfly Designs created the Shoal tent with both environmental and humanitarian interests in mind. 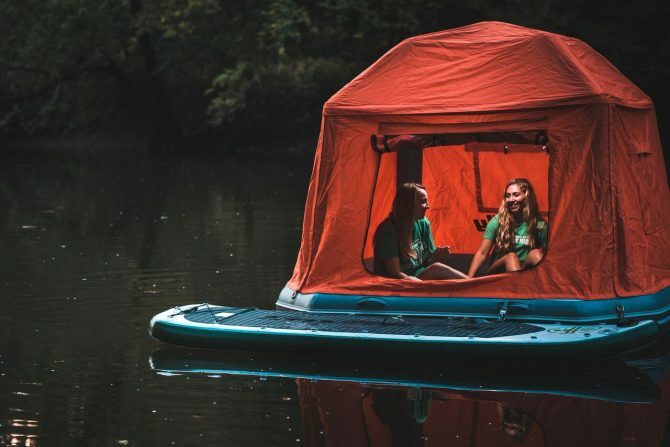 Ethan Smith expressed his concern with the increased numbers of natural disasters lately and that the floating tent might be a tool to use in those situations. “With climate change creating more frequent and extreme flooding events, local emergency management authorities could easily keep an inventory of Shoal Tents on hand to temporarily house the displaced victims without relocating the victims to large-scale storm shelters,” Smith told us. You can expect to see these things popping up on bodies of water everywhere in January of 2018, however, they’re currently available for pre-order on the SmithFly website until Oct. 31. You’ll definitely be the envy of your local river day-drink or lake-front party scene. Just add sleeping bags and a case of Corona and the Shoal Tent will take your camping game to the next level.